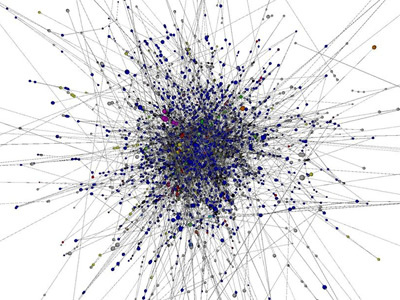 This work follows on suggestions made by Bill Cheswick, Bell Labs and Hal Burch, CMU in a paper about mapping and visualizing the internet. Project Method described by the author: "Parse traceroutes from us and public traceroute servers to random IP's and dump individual hops in a database (MySQL) with Java and JDBC. Give each node a point in space and attach it with springs to its linked nodes. Give them all a repulsive electric charge, set simulation in motion. Dump data into a table, then output some povray files and render. Also do some pretty stats and 2-D layout with mathematica." 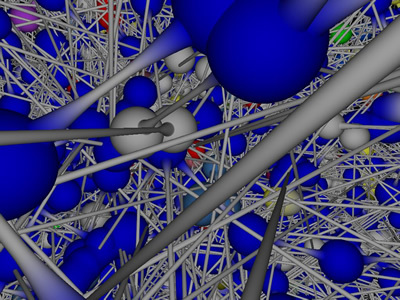 This image shows the resulting 3-D rendered network (without electro charge), with 10334 edges and 8996 nodes.